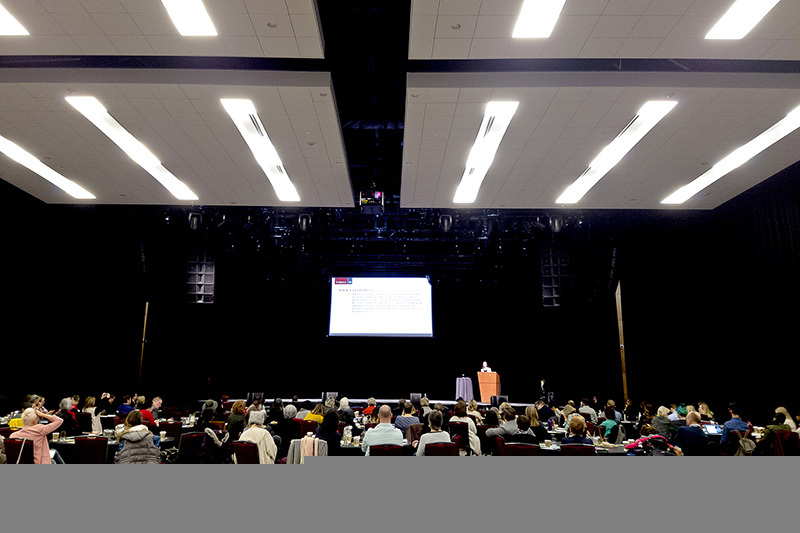 The Living a Creative Life Congress took place in November 2017 at the Grey Eagle Event Centre with approximately 120 participants. 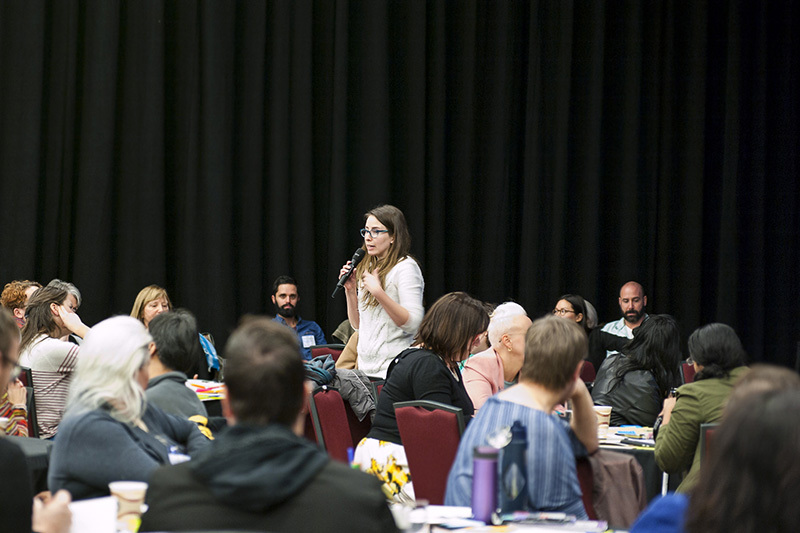 The purpose of the event was to gather feedback from the community about what is needed to make Calgary an even better city with and through the arts. We started the day with a Welcome Song and land acknowledgement by Chantal Chagnon, followed by a blessing by elder Vera Marie Crowchild and greetings from the Tsuut’ina Nation by Kevin Littleliight. Calgary Arts Development President & CEO, Patti Pon, officially welcomed everyone and explained the day to the 100+ guests. We began the programming with a brand research presentation by Vanessa Gagnon, Manager, Brand from Tourism Calgary, followed by a presentation on Arts & Culture at the City of Calgary by Sarah Iley, Manager, Arts & Culture. These presentations provided context for the afternoon conversations. Over the lunch hour, we heard short presentations from four local artists: Maria Hoover, Elaine Lee, Chantal Chagnon, and Cowboy Smithx. Each spoke about the work they do and the aspirations they have for Calgary in the future. The afternoon session, led by one of our facilitators, Brenna Atnikov, was in a World Cafe format. Five other facilitators helped guide the afternoon session. They were: Jill Andres, Anne-Marie Pham, Tim Fox, Mark Hopkins, and JoAnn Reynolds. How could the arts and creative approaches be used to mobilize Calgary’s untapped community spirit and vitality to transform the gap between how we see ourselves and how the world perceives us? 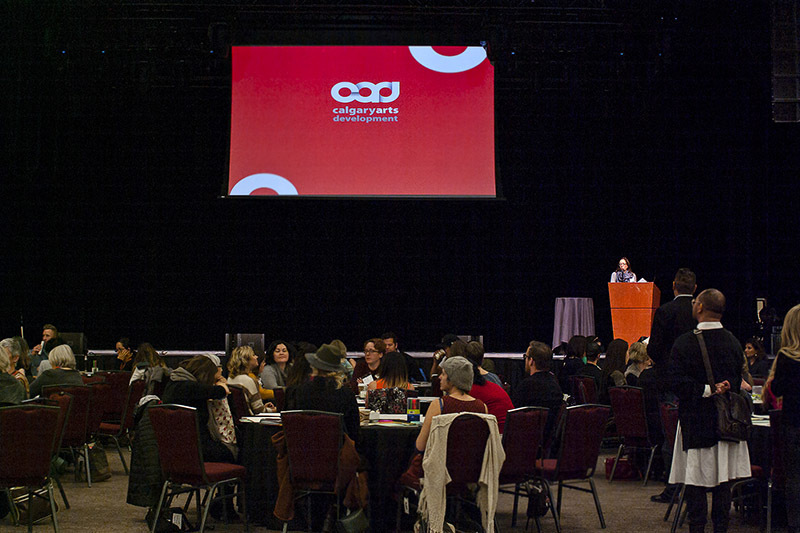 What conditions might be necessary to enable the arts and creative approaches to play a significant role in shaping the future of Calgary’s culture? After going through all of the feedback gathered from participants, the following themes emerged. Or as Cesar Cala put it: “joining the solitudes of the artist and the citizen.” A number of people suggested we expand the definition of the arts to be more inclusive, asking why do we have to differentiate between high art or formal art and hobby or personal art? Why not mount a campaign promoting the everyday artist, or artist for a day, suggesting every Calgarian is an artist, is creative—citizens as artists. This would make the arts less intimidating for non-artists, create opportunities for citizens to share their creative urges, endeavours, and even products. Community spaces could be converted into galleries, studios, workshops, instruction places. Where we take on other identities that describe our creative spirits—poets, writers, dancers, etc. Infuse art and artistic practice and creativity in all aspects of Calgarians’ lives. Part of bridging the gap is making the arts more visible. We need to change public perception of the arts in Calgary and promote how arts and culture make this a great place to live/work/visit. Promote the concept of a staycation—an opportunity to explore your own city, with booths and info centres, or an arts/literary map of Calgary, and promote our amazing assets like the National Music Centre and the new Central Public Library. Making the process of art-making more visible will create greater understanding of art practices, which could result in art being more accessible and more valued. As people become more aware they will be more inclined to speak with pride about our distinct arts community. Local artists could find more ways to participate in the Stampede in a meaningful way. And during Stampede, we could find ways to promote and celebrate other festivals. Pop-up festivals would offer surprise, wonder and awe and free outdoor events would inspire collective awe and community-building—these are ways of taking arts to the streets. Have culture and arts festivals in each ward or community–bring art experiences to communities if they aren’t already present there. It’s important to continue to promote the ways the arts contribute to making a great city and to have an artist, as much as possible, at every corporate initiative, major event, and community gathering. The arts are a tool for community building. Culture happens at the local level and there is a growing interest in applying and adopting creative approaches to community issues and social issues. We are working toward a value shift to where the arts are seen and understood as a vital part of a sustainable and healthy community. There was an interest expressed in keeping the focus very local. Community organizations need to define their own art, activations, outcomes and impacts; help citizens tell their own stories and showcase their own creativity; and ensure everyone is invited to participate. What does it look like to live in a creative community? Should we have a creative community contest? Offer funding for art projects that include community engagement? Could we have a host of community weavers or community arts ambassadors to engage with and involve citizens? Art buddies or mentors? How about placing rotating artists/creators in residence at all community centres? Or artist residents (rather than artists in residence). We know that we have artists in our midst and that they are not confined to the downtown core. How do we help them grow their art where they live, and conversely enliven where they live with the art? Artists on neighbourhood planning commissions? Can we make connections between curation and community building and use artistic practice and process as a solution tool and inspiration point for communities? And let’s make sure all communities have access to arts—not just those in the inner city but also those in the suburbs. Incorporate arts into all new developments and new communities. Free access for community members would also be desirable. Artists have a responsibility as well—to more explicitly implicate and invite people into their work, find ways to have people involved in public art display/practice, and to keep in touch with the general public. Marrying arts and business by promoting the relationship between art and business, incorporating artistic ideas into corporate spaces, encouraging private installations, and having artists in residence at companies. Platform for stories about in-house artists that make private businesses better. The issue of public art did not come up much at Congress. Just a couple of comments on how we need to shift the public conversation on public art and expand the scope and definition of public art. The arts and health is not promoted widely enough. Art can be therapeutic for older adults and children. Shift to acknowledge the power of arts in human potential. The arts connect us. In a world that is more and more divisive, the arts connect us–instead of pushing us away from each other, the arts draw us toward each other. This can start at a neighbourhood level as mentioned above, using art to connect citizens in neighbourhoods and communities, and to connect communities with communities. Arts can be used as a means to shared understanding. Arts can bring diverse people together, create spaces or opportunities for different cultural groups to mingle and get to know each other, share ideas and meet new people. The arts build bridges, reflect and gather communities, and can bring sectors together. Arts and culture can lead our city to greatness. The arts are more than entertainment, arts are for social good, can mobilize people to take action, are as essential as water, and could save the world. The arts break silos and help us move beyond labels. The arts also have a strong connection to health and wellbeing, not just through art therapy but by simple participation. Artists are storytellers. They can play a role in the economy, in making policy, in community-building. We need to change how we view artists, see art as a career, support artists through a lifecycle and include artists in conversations and decisions. The arts can help disrupt the status quo and find a new way. Equity, diversity, and inclusion was the next prominent theme to emerge. Inter-culturalism is the next level to multiculturalism. Always apply intersectionality—everything is considered. Access is a key ingredient to ensure all Calgarians can exercise their right to live a creative life. This includes access to many things such as time, space, funds, family, and physical including disability access and public transportation for all citizens including aging and low income. Identifying and removing barriers is the first step to ensuring access for everyone. There was a call for greater awareness of what supports are available in order to encourage artists and public to engage. More accessible platforms for artists and organizations—including nonprofit, community, and for-profit—to access resources. Access to affordable spaces for creation, performance and to build community is also needed. Feedback focused on unbiased empathy with no judgements, equitable systems, and an openness for all voices to share. Engage silent voices, centre the voices of racialized artists, and amplify voices that are not heard or have been suppressed. Listen to people outside the mainstream and get more input from diverse voices we haven’t heard from. In the spirit of “nothing about us without us,” include diverse communities and understand what works best for them. Empower and enable artists who currently face significant barriers such as communications, space, connections—and find ways to break down those barriers. Get rid of elitism in the arts—arts versus non-arts community. Working together is important especially when there is a language barrier. Understand all people and their cultures that make up Calgary’s diverse/unique culture. Close the gap by seeding the conversations—we may not agree on semantics, no “one size fits all” solution. Infect people with curiosity. Safe space must be created for these conversations to happen. Power transformed, not transferred. Make the privilege conversation safe to have. Embrace friction and discomfort in the safety of this space. Be aware of global issues that affect community. We all start to reflect one another, see similarities instead of differences as we make a shift from ego to soul, ego sees differences soul sees similarities. Understand that culture is reflective, not prescriptive. Make our cultural diversity visible. Tell stories that represent diverse perspectives, recognize more people of colour, offer cross-cultural opportunities, break down silos, let go of narrow narratives and identities. Break boundaries and stereotypes, appreciate all artists and artistic forms, promote inclusivity and make people aware of untapped opportunities. Showcase and celebrate individual artists and smaller artist initiatives, not just the big, cool kids. Make sure artists of diverse backgrounds are at the table for community consultations. Program more diversity spots in festivals (ethnicity, LGBTQ, ability). Embrace diversity wholeheartedly, reach out to different communities, invite new communities to showcase a piece of their culture, to share with others, allowing for all cultures to come together in support of one another. Start by identifying those communities. Be more welcoming to new Canadians and new Calgarians so they can easily integrate and feel a sense of belonging. Systems need to be more open to inclusive outcomes and strategies. Establish an equity framework. Increase support to marginalized groups, make grants more accessible and in plain English, and offer dedicated services for artists who need help. Ensure access to spaces, funding, training and mentorship for equity-seeking artists. There was special focus on Indigenous connections and relations. We are encouraged to honour the spirit and intent of Iiniistsi (Treaty) and start telling our First Nations story of Treaty 7. Don’t pay lip service to acknowledging the Indigenous people of Treaty 7 but acknowledge them in deeds and opportunities. Colonizers are not good at admitting we have something to learn but we must learn Indigenous ways of knowing and new Canadian ways of knowing. Infuse Indigenous ways of knowing, cultural practice, and artistic expression into how we live our lives. Learn to understand our relationship to the land–the land is its own entity and has a voice. Activate the “spirit” of Moh-kíns-tsis—the land we call home and use Moh-kins-tsis culture as a unifier of all people living in Calgary. Build on a small scale, very personal inter-cultural contact, ensure more representation, and don’t focus only on the idea of the city—take a broader world view. Artsdance was mentioned as a means for reconciliation, of understanding each other and the land. Calgary’s brand and community spirit were topics of conversation and feedback resulting from the presentation by Tourism Calgary and the the first question posed in the afternoon. A few people mentioned that we need to change Calgarians’ perception of who we are first—this ties in with the idea of making the arts more visible in section #1 in order to change public perceptions. Artists ambassadors. Find out what part of the brand artists identify with. Where are the gaps? Do artists feel invited and empowered to be leaders? Let artists own and represent their stories on a world stage. Bring our story to life in a visual way. Take or send artists that represent our cultural diversity on international trips designed to stimulate tourism or economic investment. The idea of exporting a Calgary-made creation came up more than once. We need to get better at telling our own story especially if we want to change Calgary’s image—let artists contribute to the story. What type of city do we want to present ourselves as? We don’t want to shake our connection with western heritage, but we need to refresh and re-contextualize who we are now, while including our past. Artists are the best people to revisit our past and tell stories that have been forgotten or erased. Embrace and visually showcase diversity as our strength to combat outdated stereotypes of Calgary. Cowboy culture is not the only culture we have. A few people suggested we stop focusing so much on Stampede so other parts of our culture can be seen and blossom. Ensure inclusivity for all and it will be reflected in our image. A number of people suggested changing the tagline “Be Part of the Energy” because of its ties to oil and gas. Tourism through the arts can be good for representing our city as urban and vital and also helps business such as new restaurants. How about a song illustrating Calgary’s vitality and diversity? Or offer funding incentives and do a specific call for art with tangible ties to Calgary. ‘Art up’ the white hat brand and greeting. People seemed to want to dig in more to understand what is meant by Community Spirit. What does it mean to be in a spirit of community? Look at what we have locally, build on that and celebrate it. Create a Community Spirit Champion job at Tourism Calgary. Put words and form to that spirit. Provide artists with a framework/platform to promote, show, and speak about community spirit. Making Community Spirit Visible. Ideas to generate community spirit included the community spirit bus line. Declaring Bus # 1 as Calgary’s cultural, heritage and community development route. The bus as a moving stage for community artists, organizers and curators to talk about the diversity of creative endeavours in the neighbourhoods through which the route passes (Bowness to Forest Lawn through the downtown core). Tourism Calgary can take this on. There are probably more than 50 things that can be cited along the route. Promote community groups and hubs across the city as the spirit of Calgary because the spirit of a city is in its neighbourhoods. This aligns with the community-building ideas in Section #1. Creativity is our spirit—it is all around us, focus on celebration and small positive disruptions. Creativity is sustained through the arts. Find events that already embody Calgary’s community spirit, such as hockey games, and infuse them with arts and culture. Invest in Calgary stories in film, Calgary actors, Calgary crews and sets versus mega US companies. 48 hours in Calgary–focus on arts events, not just food or outdoors or attractions. Or 52 weeks of events and festivals that demonstrate community spirit. Always be original and figure out what is our arts and culture innovation—a made-in-Calgary approach versus copying or following other cities. Create a Tourism Calgary promotion or #hashtag to capture community spirit content for campaign. Funding is always needed in the non-profit arts sector to create art, develop talent, and produce work for presentation. Support is also needed for individual artists, most of whom are not able to make a living solely from their art practice. Even with supplementary income, artists’ average earnings are still much less than the average Calgarians’ income. Probably it’s for that reason that conversations about guaranteed income and living wage came up in the feedback multiple times. Echoing what was heard about localizing arts in neighbourhoods and communities in the bridging the gap section, there were several suggestions to fund artists/animators in each community association or to have community art subsidies for neighbourhoods, organizations and initiatives. Because there are not enough resources, there is currently too much competition for too few grants. Some suggested that there should be a refusal to participate in competitive processes as these create silos and create adverse/competitive versus collaborative/innovative. Funders are stuck in old models and need to simplify funding mechanisms for artists and small or emerging organizations as well as be more open to cross-sector and cross-issue funding. Sometimes applications are too long and require too much proof. Artists and arts organizations need financial stability—precarious funding is not workable. Several people asked for operational funding for artists (there is currently only operational funding for organizations). Start by asking artists and listening, encouraging experimentation, and accepting the potential for failure. Provide support for artists at all stages of their careers including emerging artists and include training on how to make their business and practice grow. Create an environment where artists feel valued and included, where they seed the conversation about the creative culture. Helping artists feel legitimate will help to change the culture. When Calgary was cultural capital of Canada there seemed to be enthusiasm and investment in moving people up the artistic chain. Now it seems that funding is not geared to creative culture but to numbers. What are the metrics of artistic, creative, cultural impact and how do you measure those things? Invest in the growth of small organizations and artists who could contribute more to the city and economy if they could get over the hump of start up. Micro Grants with less defined conditions, that are accessible to all people, not just grant writers, would be good. What kind of framework can exist for creativity and entrepreneurship? What incentives could be put in place to build sustainable, scalable, saleable, business structures? To increase resources, many ideas emerged including educating potential “clients” of artists to understand the importance of providing fair and consistent compensation, creating a register of “project possibilities” that anyone can contribute to (not just non-profit), creating an artist bank, matching community funding with business donations, requiring cross/inter-sectoral collaborations for funding, Hotel Association funding for tourism, events, and festivals, Banff collaboration, and providing incentives for private sector funding. Better communication would help including more information for citizens on how to access funding, education for artists about the process, cycle, and metrics, programs to help start-ups and not-for-profits either incorporate or to be a project-specific group. We need funding to make Calgary attractive to the film industry, such as grants, rebates, incentives, that could compete with BC and Ontario. Policy, structure, bylaws, and City Hall had its own focus, likely because of the presentation by Sarah Iley in the morning and also as a response to the question about what is needed to achieve the Calgary we aspire to having (for the arts). The Cultural Plan is a welcome addition—there is a hope that culture becomes widely accepted as a pillar of city building. Courageous leadership is needed–a move from a risk-averse system to a bold, risk-taking attitude, starting with ideas and moving to opportunity—a growth versus a fixed mindset. Create 10-, 30- and 50-year visions and offer true leadership, thinking beyond the four-year election term. Base community engagement with City Council on transparency, intergenerationality, and clear channels of communication. Keeping City Council informed would instill a deeper understanding of the value of the arts and help leadership see the role of art as a public good. This would lead to greater backing both monetarily and philosophically, although investment is necessary—you can’t get transformation for nothing. City leaders and politicians need to see the impact of the arts in their ward. Perhaps we could decentralize some decisions by placing them with community leadership. Add the word “community” to the City’s policy statements. Have an artist in residence at City Hall. There were several comments about adjusting bylaws: to recognize the needs of artists for zoning, supporting creative flexible spaces such as home studios; to allow simple pop-up art; and to relax rules around street noise. Less red tape and a simpler application process would make it easier to get permits and licenses and to get more help with outdoor festivals and events. Identify and remove barriers to getting support. Better access to information is needed about how policies are made and shaped. Artists should be involved in arts policy creation. There is a desire to transform how power is held, from the man up top to everyday people with government as a facilitator and leader versus regulator. Some people want to learn more about how to be engaged in advocacy—how can the City hear more from arts and culture? An education/youth focus is important and necessary. We should recognize the significance of arts education and adopt an artistic integrated approach from an early age, complete with the required investment to do so. There should be an artist in every school as well as an art teacher or a teaching artist. Change STEM (Science, Technology, Engineering, Math) to STEAM by adding Arts and embed artistic process whenever possible. Having arts as a tool for learning in all areas of curriculum is good, as well as inviting kids to participate so they can discover their own creativity through the arts and learn who they are. Take advantage of Augmented Reality and Virtual Reality to engage youth in and outside Calgary. And continue the focus beyond high school—make sure ACAD not only endures but is an integral part of our city, and offer continuing education opportunities as well. Arts can be used to engage and mobilize our youth and help develop skills around community development at an early age. Feedback from the Congress supports the research we conducted in 2016 and published in Building on our Momentum: Arts & Culture Infrastructure in 2017. There is a lack of creative spaces and a strong desire for shared work spaces—community art hubs—affordable, sustainable, safe, and accessible spaces in every neighbourhood, including outside the downtown core, accessible to everyone for creative pursuits. Less red tape to access public spaces and the ability to create outside of traditional venues. How about available space for artists in office towers? Embed creative spaces in all aspects of business and also at City Hall. Affordable performance spaces, studio spaces, and spaces for gatherings and conversation are also required. In addition to the small arts hubs, we need more large scale venues, both indoor and outdoor, to host quality creative events, some outside the downtown core. And sustainable arts training centres of all kinds from the formal institutions like ACAD and the Conservatory to in-school facilities and places to learn cultural forms. We need to tell our story better and to increase awareness about the arts. Tell a positive story, use active language, engage the disengaged, give citizens a voice through the arts, share our stories, and make our communications more personal. Increase the profile of artists in Calgary, and promote arts and culture events. Have arts ambassadors in all communities, or arts champions like there were in 2012. 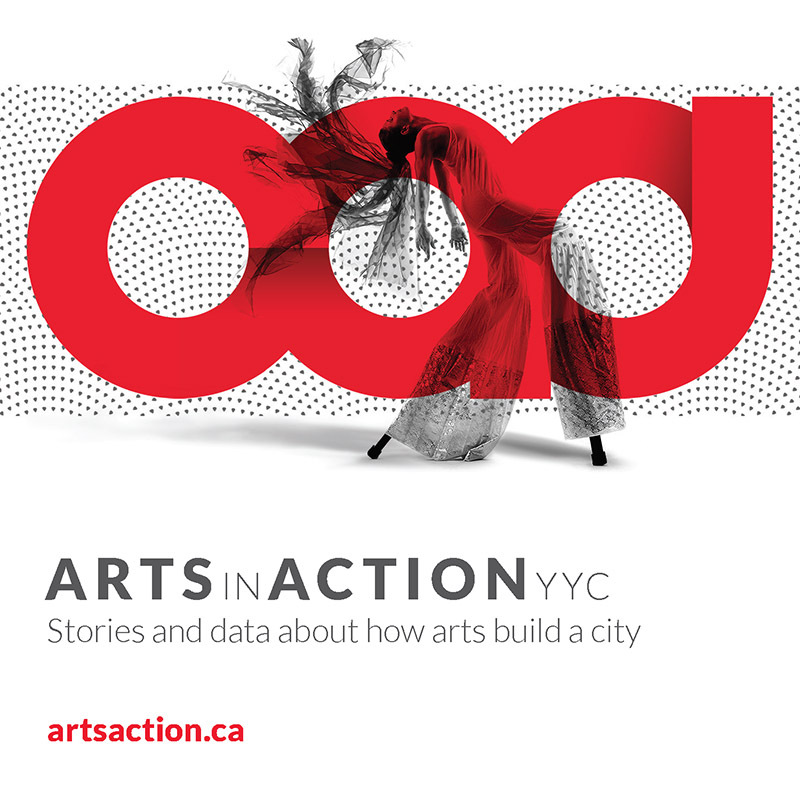 Provide Calgarians with tools to become arts ambassadors. Exposure of our arts and artists will tell a good story about Calgary—either by exporting or exhibiting local talent elsewhere, through promotional campaigns that feature the arts and not just western imagery, by disseminating film and video projects that showcase Calgary, or through national or international press. Change the language we use—merge art language more with everyday life and use plain English. Expand the meaning of “artist” to be more inclusive. Use the language of citizens, not artspeak or jargon. A central information hub was mentioned multiple times—perhaps a radio station or a radio spokesperson, an online platform for sharing information, a central web centre, centralized event listings, and the return of arts journalism. Support YYScene as a central hub for communication. Make sure Calgarians are informed about what’s happening in their city and find ways to create awareness about creative communities in Calgary. Embrace social media, Augmented Reality, and joint marketing. Collaborative work models with arts organizations working together would be beneficial. From shared work spaces to shared services to bringing different groups together to create a large scale festival or artist project that can attract international attention. Increased investment is needed—arts organizations are underfunded. In addition to financial support, the arts and artists would also benefit from access to legal advice, communications, and invitations to participate where our narratives are shaped (Calgary Economic Development, Calgary Chamber, etc). The arts can find common ground with many other sectors. We need to create and build intention over time as we cast a wider net and build more relations and collaborations with a bigger emphasis on incorporating creativity across sectors. For example, explore opportunities for art and cultural connections between social services, arts, and community associations, or arts and business. With a bold vision we can move forward collectively. Better living conditions for artists would make Calgary a more attractive city to live in, including access to affordable housing, insurance, health benefits, affordable work space. Calgary could lead with the arts, making the arts central and not an afterthought. This would be a catalyst for new ideas and innovation, encourage vibrancy, bridge generational and cultural gaps, create open-ended opportunities for all citizens in every neighbourhood to engage, help develop a creative economy, and exemplify community spirit.